The formal performance review has become an embedded part of measuring public service. It can be administered annually, quarterly or monthly. Initially, it is connected with a probationary period and later with promotions or lateral movements in an agency. The review, or evaluation, is often a rubric checklist designed to measure the degree to which the employee accomplishes the core elements outlined in the job description. These elements represent the performance foundations one must meet on the job, while performing the job. What rarely gets mentioned (and certainly almost never measured) are those elements of public service not written as part of the job description. The top-table notions of sacrifice, love and commitment are immeasurable, non-mechanical and personal. We all know public servants that embody these notions. We admire their work, and we speak well of them, but we do not build an analysis around their service beyond the job description. To do that, we must assess what they are trying to accomplish and what drives them to serve when there is no personal gain in doing so. Mary Parker Follett may be able to shed some light on these performances. In her 1926 article entitled, The Giving of Orders, she wrote that “unless you change the habit-patterns of people, you have not changed your people.” I believe that the public servants that we have come to know and admire understand this on a molecular level. They know that in changing their own habit patterns, they set in motion a positive social investment that can mean moving entire communities forward. Which habit patterns are we talking about? We are talking about the patterns that prevent us from serving beyond the job description. We have even said as much when asked to go that extra mile, haven’t we? How many times have we said that something is not in my job description? I am not saying that public servants do not work hard or that they should work for free. I am actually suggesting just the opposite. When we assess our habit patterns, we free ourselves from the drama associated with past beliefs that our work is historically technical. When we free ourselves from the burden of past patterns of performance, we give ourselves the opportunity to form new habits to address pattern changes in the demographics that we serve. The performance foundation of the public servant is tied to the idea of active rescue. No one can tell you what that is or what that idea means to you. What comes to mind when most people think of active rescue are the steps taken during a disaster or other near-tragedy. For public servants, active rescue means going to work. It means changing our habit patterns in a matter of weeks, days or seconds. Public servants are in active rescue whenever we interact with the public. Disaster aid assistance in Puerto Rico is active rescue. The application for affordable housing and the subsequent placement of a citizen in safe and secure housing is active rescue. Delivering on the promises of social security to the elderly and health insurance to the needy are examples of active rescue. Active rescue is not fan-fiction and it is not meant to flatter. My father-in-law, Ebrima Samba Saye, was the embodiment of what is notable in a public servant. He was born and educated in The Gambia before receiving a Master’s Degree from Harvard University. He returned to The Gambia and served for almost thirty years as Commissioner of Income Tax. He trained public servants, he lectured public servants and many of his mentees are serving others throughout Africa and throughout the world. He always made himself available for discussion, debate and serious talks about life and about the future. I visited The Gambia and followed my father-in-law around for weeks. I admired the personal contact he made with everyone and while observing him, I managed to capture a tender moment between him and some lovely children in Manije-Kunda. The photo shows a true and unfiltered moment of active rescue and love. I am still touched by that photo and moved even more so by his sacrifice. Commissioner Saye passed away a few weeks ago and is missed by all who knew him. I do not believe that society no longer produces legends. I know this because I have been blessed to have two fathers—one prepared me for life and the other prepared me for the rest of my life. 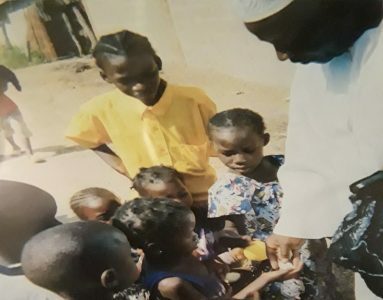 Image: Ebrima Samba Saye, Former Commission of Income Tax for The Gambia. Photo taken by Lisa Saye in Manjie-Kunda, The Gambia. This an amazing piece Dr. Saye and how you creatively linked the public service with the good work of your late father in-law. Dr. Todd thanks for your additional comment regarding the notion of active rescue. Service beyond the job description is indeed hard to quantify, but as you stated..public employees do so one client or patient at a time. Hassan, thanks so much for your enlightening comment. There are rewards that extend beyond financial ones and those are the ones that really respond to the character of the public servant. Mike, thanks for your comment. I am always humbled by your kind words. Kelvin, thanks so much for your comment. You’re so right about continuous monitoring. Once again this article focuses on a profound issue that is of critical importance in the public sector. One of the critical component of performance management as accurately stated in the article is a comprehensive system that measure all aspects of performance. However, one of the challenges of the performance measurement systems is the need for continuous monitoring of performance and comprehensive measure. Your article is very inspiring. Helping others always brings me great joy. You are absolutely correct, sometimes a public servant must go beyond the job description to help others. Great photos and as always job well done! ……another insightful piece from a quintessential academic. The narrative has high appeal in many quadrants: public service, human relations, and society. The article is good enough for an Oscar. I totally agree with you, that job performance evaluation cannot measure the service beyond the job description. Therefore, the system of bonuses or promotions may lack the basis that measures those degrees of performance. In some countries, however, incentives and bonuses come in the form of honors, where top honors are offered, and are usually offered to people who provide great service to the community. Such as medals that provide military… etc. Which is worth more than any financial prize. Often these people do not care much about promotions and bonuses, as much as they are interested in sending an influential message to their community, and to achieve a positive change. Regarding to your father-in-law I believe this article is an honor to his soul, where people they can know about him and the know the service he offered to the community that are beyond the job performance, therefore, the loving Memory of your father-in-law it will not be forgotten. May his soul rest in peace, God bless his soul. Dr. Lisa Saye’s intuition on how and why persons devote their employment lives to serving government agencies is amazing. “Active rescue” fills the need for public employees to do above and beyond what is expected of them. Unfortunately, these actions are individualized and hard to quantify;and therefore hard to financially compensate. This article is key for supervisors and other Public Employers to explain why people continue to come to work with low pay, offices in need of upgrades and more work than their desks can hold. Public employees continue to do individual, active rescues one client or patient at time, multiple times a day, and uncountable times in a year.